Let’s all grab this deal and pack our bags! I want to go to Hawaii and this is the perfect deal! Plum District is offering a 5 day 4 night trip for only $149 through courtesy of RedeemYourVacations.com! If you use code “frugaldayplum” at checkout, you’ll get another 20% off making this deal only $119! That not even the cost of one night at most places! Obviously airfare is not included. Head over to Plum District for more information on this deal. Since it’s an online deal, anyone can purchase it! Offers Jun 23, 2011 in family, travel · Expired! Do you ever have one of those days where you just want to toss your budget, lay on the beach, and pretend all is right in the world. That’s me today. So, if I did that, here’s the deal I’d buy. Eversave has a three-night, all-inclusive package for two at The Taheima Wellness Resort and Spa in Puerto Vallarta – plus golf or spa service ($990 value) for $299. I don’t have $299 burning a hole in my pocket but I’m really hoping one of you do and that you’ll be so kind as to take me with you! Daily deals May 26, 2011 in entertainment, travel · Expired! Eversave has a great deal going on. You can get $50 for $100 off your booking at www.TravelocityIncentives.com through Eversave. I know summer is coming and if you want to save some money on your hotel stay, you should check out this deal. Head over to Eversave and sign in or sign up to get this deal! There is also a new member $4 credit, you can get this deal for $46! Daily deals Apr 30, 2011 in travel · Expired! It looks like we have a couple big vacation coming up later this year. I’ve been searching online for the best travel sites to get a head start on the planning. Normally I would just go with it but traveling with a soon-to-be three year old, things change. 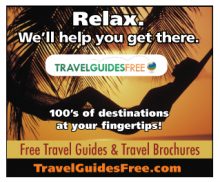 If you are planning a big trip this summer or just plan on staying local, check out this site, TravelGuidesFree.com, They have free travel guides and brochures for many locations. Daily deals Apr 3, 2011 in Groupon, travel · Expired!